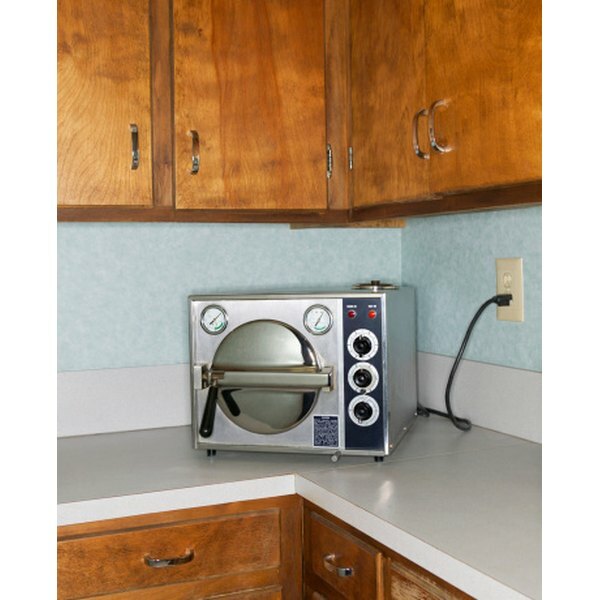 An autoclave, whether for use in a medical office, body art salon or beauty salon, is essentially a pressure cooker used to kill bacteria and viruses. By virtue of pressure and superheated steam, an autoclave will destroy any micro-organisms on metal objects used in these settings, allowing for the reuse of metal objects without the risk of infection. Medical and research laboratories also use autoclaves sterilize culture media before growing bacteria for experiments. Autoclaves have four basic parts. An autoclave needs water to make the steam used for sterilization. Smaller models will have a reservoir that requires you to refill it before use, as with a coffeemaker. Large standing models, such as those used in laboratories, will have a water intake hookup or hose, allowing the user to pump water directly into the machine. The chamber is the space where the user places items to sterilize. In the chamber are wire racks, like those in a dishwasher, which will hold various items upright or lying down and allow for steam penetration from all angles. The control panel allows the user to customize the autoclaving process. Some materials can withstand higher temperatures, while some must be autoclaved at lower temperatures for longer time. The heat, pressure and time will vary with each type of item autoclaved, creating the need for a control panel. Some autoclaves will include automated settings for specific autoclaving functions; these models will have "fast buttons" for those settings. Autoclaves must have an air pump system to remove the oxygen in the chamber and create a vacuum which then fills with pressurized steam created from the water in the reservoir. The water becomes heated either via a heating element inside the water reservoir or a heat-generating mechanism that completely surrounds the reservoir.